The ghastly death of a 23 year old techie is in news and that throws open lot of Questions ! in a Metropolis brimming with floating population, crimes do get reported … but this murder is to be not seen as an isolated incident and there is imperative need for action from many fronts. In what would remind one of some film stories, 23 year old B. Uma Maheswari, a software professional with Tata Consultancy Services (TCS) at the SIPCOT IT Park in Siruseri, went missing on the night of Feb 13 and a few days later the decomposed body was found in a bush hardly 200 hundred metres from her office. A Police official is reportedly suspended and news reports suggest that Kancheepuram police met with officials of five IT and BPO firms and urged them to tighten security, especially for women employees. Police officers issued a set of instructions to the companies which included posting armed guards, installing security cameras, ensuring that woman employees working night shifts take only office cabs with security guards to return home. The officers also suggested that companies note details of cabs and autorickshaw drivers that enter their officers to pick up employees. They asked the companies to check the antecedents of drivers they hire. Women employees should not travel alone, even by office transport, but be accompanied by a colleague, they said. IG Manjunatha told TOI that police would start patrolling the locality regularly and said he had requested that a police outpost be set up in the area. TOI report states that the knee-jerk response to the murder did not impress all the company officials and employees blamed police for poor patrolling that allows strangers to lurk around on roads at night. They said there had been an increase in crimes against women in the area because of lax policing. 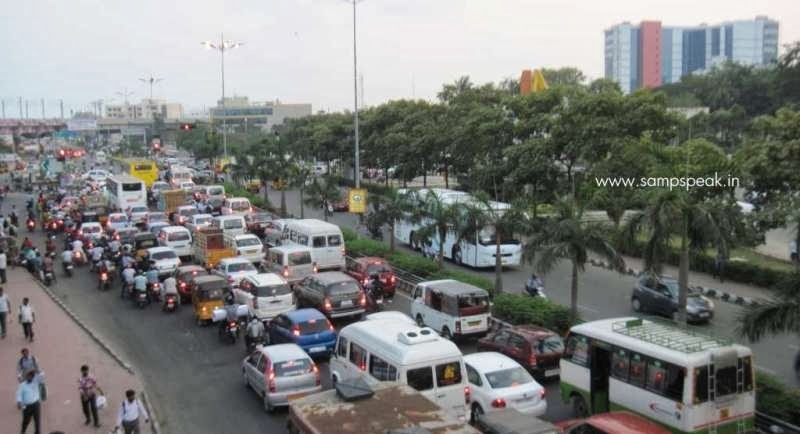 It is common sight that not all are provided with transportation and many are seen walking in the main road, waiting for public transportation, travelling by crowded share-autos; the Railway stations at Perungudi, Tharamani, Thiruvanmiyur … are overfilled with heads in the peak hours. Some say with sadness that Kelambakkam police did not attach any seriousness to the ‘missing person’ complaint by the father of Ms Uma. Reports suggest that the post-mortem revealed stab injuries in her stomach and abdomen, and the police have registered a case of murder. The personal details of the person, that she was native of Attur in Salem, graduated and was hired in Campus recruitment, joined the Company and was at Siruseri are of little relevance. It is stated that she was last seen leaving office at 10.10 p.m. on February 13, which was recorded on a CCTV camera at the facility. reportedly she took permission and left early than usual but sadly never reached the rented home at Medavakkam, which she shared with two of her colleagues. This gruesome murder to new to Chennai but is not totally unheard of for the Nation. There had been crimes against working women, especially who have to work late shifts – at the Nation’s Capital, Bangalore and in a couple of other places. A couple of years back, Delhi Police mandated that BPOs, Corporates and Media houses should drop their women employees at their homes during night hours and also confirm their safe arrival. It also made compulsory that a security guard should accompany the woman employee to her residence and ensure her safe arrival if the office vehicle cannot drop her right outside her house. The Police further added that the cab drivers should not pick any stranger or stray away from designated routes. They further suggested selecting the routes in such a manner that as far as possible women employees are not the first to be picked up or the last to be dropped. The instruction also asked the employers to maintain a database of all employees, security personnel, cab drivers and contractual workers, which the police could access, besides hiring security personnel and other contractual personnel as far as possible from licensed agencies only. It may never be possible for Police to provide individual security …. It makes sense for all concerned to be concerned about the safety aspects always…. Coming to work and having to work at odd hours is a reality …. Long travel from workplace and residence is another…… ..in between – the Companies and the individuals need to strategise and plan practically – the mode, time and accompaniment of travel – leaving nothing to choice – after all, safety is the most important aspect and one cannot dangle with danger even for a short while. Sad the life of a techie was brutally snatched away ~ the culprit may be found – may or may not get proper punishment – may be by some quirk, even the offender’s punishment may get curtailed ~ the techie may never come again, the pain and suffering of the poor parents may never heal ~ we all will pray for the departed soul – more importantly, plan and ensure that such a ghastly incident is never repeated.